1. You need to start with yourself. Know yourself. Appreciate your gifts and understand and accept the flaws you cannot change. Work on the ones you can. Be the best version of you before seeking the best version of someone else. 2. Hearts are broken, but not destroyed. If you put yourself out there, you will, inevitably, at some point or another, have your heart broken. It will hurt. You will grieve and you will become angry and your pride will take a beating. But some day, both slowly and seemingly all of a sudden, the pain will stop, and you will love and be loved again. 3. You cannot make someone love you. Again: You cannot make someone love you. 4. Love can be sneaky. Someone you'd never considered will one day, unexpectedly, cause your heart to bloom. 5. There is no such thing as "The One." You may indeed find the one person who is willing and able to grow with and alongside you through the years, through challenges and joys and losses and quiet. Or you may not. You may, instead, find many "Ones" to love and be loved by. Don't sweat it. 6. Sometimes love doesn't feel like strong enough of a word. 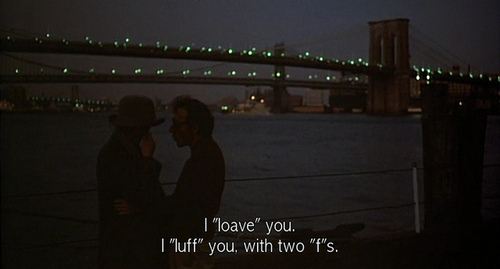 You'd be surprised at how quickly love grows into luff. With two f's. 7. Love is work, and it is hard. Give the people you love your time and your effort, even during the bad times. Don't be afraid of the struggle. Sometimes you need to know when to stay and fight. 8. Love will not solve relationship problems. You need more than love to pull through tough times. You're going to need to cultivate patience, empathy, and the ability to know when to concede. And, sometimes, things become broken beyond repair, despite your best intentions. Don't attempt to put a salve on a broken limb -- move on. 9. There are many kinds of love. Open yourself up to the different ways love will find you. It might not always be in the ways you expected or planned for. 10. Love looks different to different people. Other people's relationships might seem strange or mismatched to you, but that's fine. It's not for you to get. Even if it's really just you singing in the shower. 12. ...And often speaks in a whisper. Or with no words at all. 13. Love will surprise you. Don't close yourself off or harden your heart to possibilities. Doing so won't protect you from being hurt and will only shut you off from someone different and new. 14. Love will make you better. 15. ...And sometimes brings out your worst. 16. Love is neutral, and as bad or good as you make it. A cake is only as good as the ingredients you use to make it, right? 17. And do not confuse being distracted with being in love. Love is not a placeholder for emptiness. 18. And know that, the louder the performance, the quieter things are backstage. You don't need big declarations and demonstrations when you both know you have the real thing. Like a shoe that's worn in just right (and has seen you eat an entire pizza in your pajamas while you're fighting off a cold). 20. But do not mistake comfort for love. A routine feels safe, but don't let it take the place of real joy. 21. And do not mistake attention for love. Some people just love the idea of love. Whether you are there, or someone else is. Don't be a minor character in someone else's play. 22. No one owes you love. Allow it to be given freely and with enthusiasm. 23. Love does not keep score. Relationships aren't a tally of times you were wronged or slighted. Forgive. It keeps your heart healthy. 24. Love means constantly saying you're sorry. 25. Love will change you. 26. And sometimes disappoint you. But you can and will get over it. There will be pain and hurt and illness. There will be scary moments, and downright ugly times. This is what you sign up for. This is a part of it. 29. Love won't give up on you. 30. ...So don't give up on it.